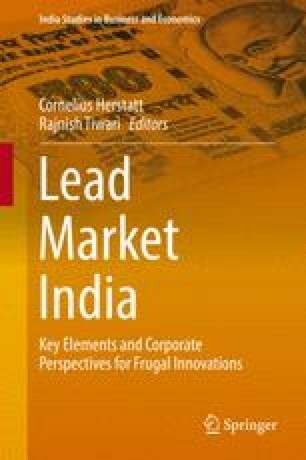 The present work “Lead Market India: Key Elements and Corporate Perspectives for Frugal Innovations” documents the evolution of the research on globalization of innovation not only at our institute but also at a macro level. In 2006, when we decided to set up a research project “global innovation” to investigate internationalization of research and development (R&D) and its transcendence towards globalization of innovation, the world still looked a little different. Even if India was registering impressive growth in gross domestic product (GDP) and attracting large amounts of foreign direct investments (FDI), a lot of skepticism remained with regard to India’s potential to create innovations to cater the rising demand of its people. The dominant logic then was still that “lead markets”—markets that provide key impetuses for globally successful innovations in an industry or industry segment over a sustained period of time—can only emerge and exist in the economically developed world. A country in the developing world, such as India, was therefore not seen as a lead market or even having the potential to become one in near future. However, much water has flowed down the Ganges and other rivers since then. In this work we present results of 10 selected studies that have been conducted at our institute in relation to India, its lead market-potential for certain innovations and its penchant for frugal innovations. Rajnish Tiwari would like to sincerely thank Claussen Simon Foundation for supporting his research at TUHH with a generous grant.